The other day I was craving Thai flavors, but didn’t have too many Thai ingredients on hand, so I made this soup with the inspiration of Thailand and what I had on hand. It came out pretty tasty! The sweet coconut milk, ginger, and spices did the trick! This is perfect as a soup, or it would be delicious over some rice or quinoa. In a soup pot, melt the coconut oil and add in the lentils and onions. Saute till the lentils are soft, about 5 minutes. Add in the spices, stir to coat, and then the vegetable broth. Bring to a boil. Then turn the heat down to a simmer. Let cook for 30 minutes, stirring occasionally. Add in the carrot. Let sit 5 minutes and add the cauliflower, and potatoes. Let cook for about 15 minutes or until veggies are fork tender. Add in the coconut milk. Stir and season with salt, and pepper. 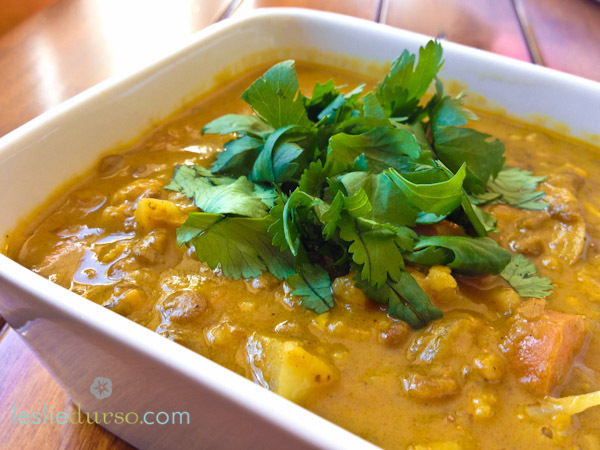 Serve warm alone or with rice topped with fresh chopped cilantro. This looks so amazing! I love recipes like this (: I have all these ingredients in my kitchen minus the cilantro. Thanks for sharing! I’m making this tonight!